Plugging in the drive was slightly more trouble than I thought it would be. 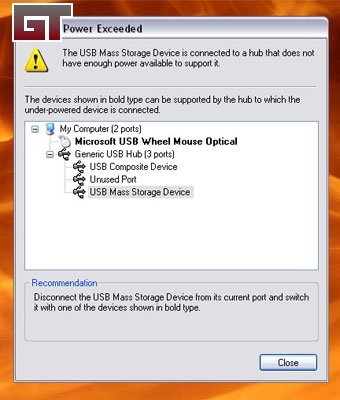 Neither my keyboard�s USB hub nor my regular hub would power the drive. Whenever I would plug it in to either spot, I would get this message, and the computer cut power to the drive. Either the drive draws a substantial amount of power, or both of my hubs were already at capacity (neither one is externally powered). After moving some stuff around, I was able to free up one of the USB ports on the back of the machine. After this, the drive powered up fine and I had no more power warnings. It was at this point that I realized that all of my USB ports were running the 1.1 standard, and I had no ports that used the 2.0 standard. 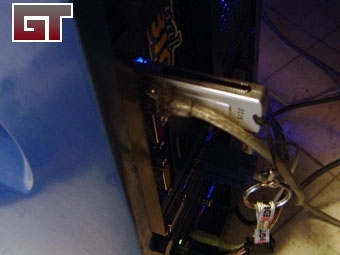 While the drive ran fine on 1.1 USB, it made benchmarking pointless. Not to be deterred, I ran out to my local Wal-Mart (no electronics stores out here) and picked up a Belkin USB 2.0 PCI card. Now I have a way to compare the differences between USB 1.1 and USB 2.0. 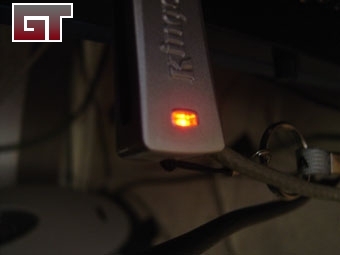 I did notice that the LED would light up red whenever it was connected to USB 1.1 and it would be blue whenever it was connected to USB 2.0. It also blinks with activity, similar to the activity light on the front of your computer.